For a much needed break! Back in a couple weeks. Time for a little Friday fun. There has been a lot of talk on various forums about 'balance' in Frostgrave and how some warbands can become much more powerful than others. That's true. It's part of the price of playing a game with lots of random treasure tables and ways to earn experience points. However, I believe with only a bit of effort players can create scenarios that can easily address this imbalance. Here is my own quick attempt. It's unofficial, and I have not play-tested it. So if anyone gives it a try, let me know how it comes out. (A player may call for this scenario whenever he is facing a wizard who is ten levels, or more, higher than his own). Two days ago, an errant fireball came crashing through the door of the ruins where the snow troll Gronash made his home. The resultant explosion destroyed two small barrels of wine and a rangifer carcass that Gronash had been looking forward to devouring. Needless to say, Gronash was not pleased. Calling upon a couple of his cousins, Gronash has gone off in search of the wizard who destroyed his dinner. Set up the table as per a standard game of Frostgrave. 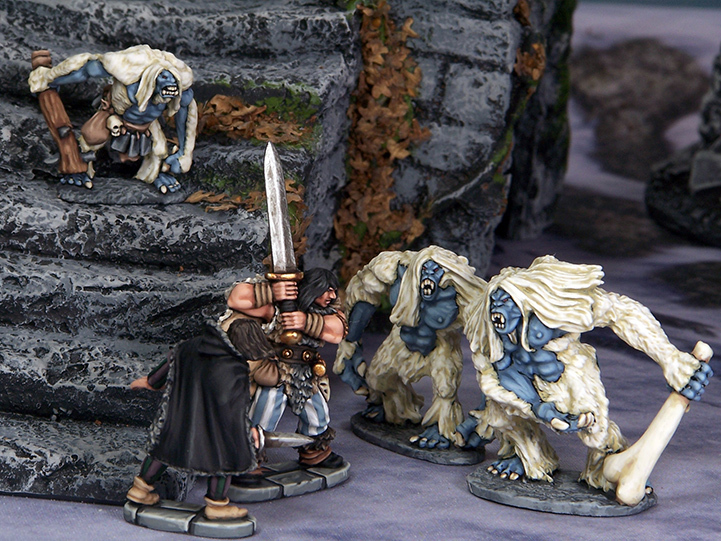 During the creature phase on the first turn of the game, a snow troll figure should be placed at each of the middle points of the two side board edges (the sides not used by the warbands to enter the table). These snow trolls may act immediately. In the creature phase of the second turn, a third troll enters the board in the same fashion as the previous two. Roll a die to determine on which side of the board he enters. These trolls have caught the scent of the wizard they believe to be responsible for the destruction. They are only interested in teaching him and his gang a lesson; they are not concerned with anyone else. The trolls follow the standard rules for creatures with the following exceptions. - These troll are highly motivated and have a Movement of 6. - The trolls are uninterested in the warband of the lower-level wizard. Ignore these figures when determining the troll’s movement. Trolls will not force combat with these figures. They are never considered In Combat with a member of this warband unless a figure from that warband is in base-to-base contact and declares an attack on the troll. - If a troll would normally take a random movement, it instead makes one move in the quickest line towards the higher-level wizard. (If there is any doubt about this line, the lower-level wizard gets to move the troll). - If the higher-level wizard is killed or flees the board, the trolls start moving toward the nearest board edge. At this point, they will not move into contact with any figure, nor force combat. They will move around any figure that is in the way. Treasure is the same as in a standard game of Frostgrave. Calculate experience in the normal fashion with the following additions. +25 Experience for each snow troll killed by the higher-level wizard. +25 Experience for the lower-level wizard for each snow troll that exits the board or is still on the board at the end of the game. There are lots of reports coming in from across the UK that people are receiving their Frostgrave - Nickstarter packages. Hopefully, people in other countries should be receiving theirs soon. I look forward to hearing reports about their first games and how they find the rules. 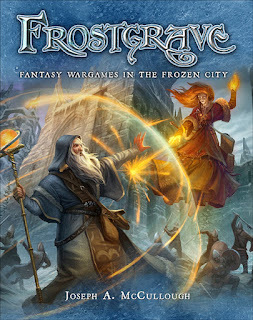 In the last couple of days there has been an exciting little development for Frostgrave. The game has been granted it's own board on the Lead Adventure forum! Lead Adventure has been my favourite wargaming forum for awhile now, so I'm thrilled that these guys have gotten behind the game. I will be using this forum as my main place to discuss rules, scenarios, and all things Frostgrave. That said, I will continue to post any major news items on this blog, as well as sharing occasional articles for the game or thoughts about game writing and design. Anyway, head on over to Lead Adventure and check it out! A few weeks ago, I was in London for work and got a chance to stop by The Orc's Nest, a little gaming store just off Shaftsbury Avenue. Among the many fun items on the shelves, were a batch of the newest Bones releases from Reaper. I have only minimal experience with Bone miniatures. I have been somewhat put off by their kind of rubbery texture and that fact that the weapons within the packs often look badly bent. Still, I thought it might worth giving them another try. 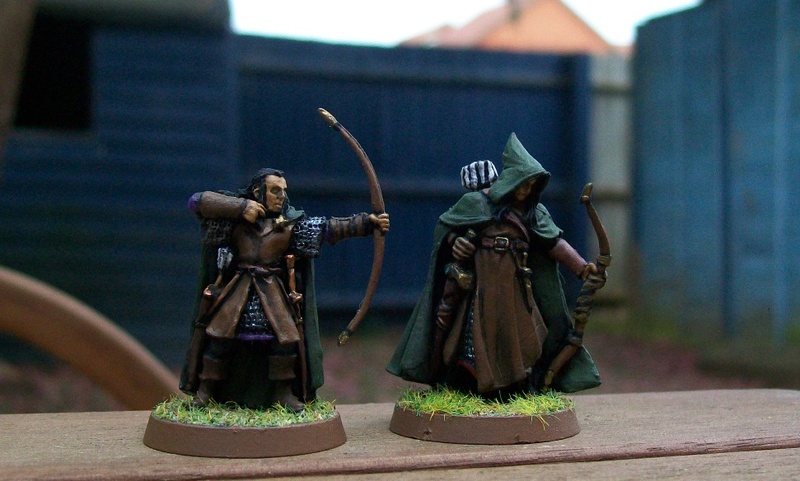 One figure, especially, jumped out at me, an Elven ranger who looked like he would fit in well with the Dunedain I had recently painted up. Considering the soft nature of the Bones material, I thought I might be able to cut the figure off its integral base and mount it on a GW base, so it would fit in with the rangers. Well, for a mere £2.50, it seemed worth the risk. I am pleased to say, working with this figure was a terrific experience. I was able to easily slice the figure off its base and remount it. Now they claim that Bones miniature don't have to be primed, that paint will stick to them just fine without it. I am curious if that's true, but in point of fact, I much prefer to paint over a black base instead of a white one, so I went ahead and primed the figure. I took my time with the painting, doing my best to match the colours and treatments I used on my Dunedain. While white, rubbery bones material tends to make the detail on the figures look soft, I am happy to report that's not actually the case. The detail is very crisp - perhaps not quite as crisp as metal, but not far off. The only potentially bendy element on this miniature is the top of its bow, but it looked fine, so I didn't worry about it. (Apparently bends can be fixed by reshaping in hot water). Anyway, I recently finished him up, and I've got to say, I'm very happy with results. 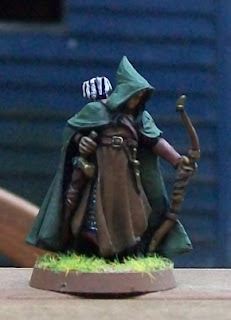 The miniature really fits right in with The Lord of the Rings ones, a perfect Elven ally for my Dunedain. After this experience, I'll definitely be paying more attention to Bones. It is certainly flattering to have my game mentioned in the same breath as some of my favourite authors! More to the point, it does appear that the reviewers understand the intent of the game, and it definitely sounds like I managed to tap into a bit of their childish enthusiasm! After writing the last blog, I saw a negative comment about the game online, and it got me down. (Enough that I've instituted a 'no more checking forums before bed' policy!). I've heard that to be an author, you have to have thick-skin. You don't (I don't) - but, if you don't, you'd better be able to get back up when you get knocked down! I'm back up. These reviews help. Really though, I just need to flip through the book again,to remember - hey, I'm proud of this game. And many thanks to the guys who commented on the last blog - that helped as well!